Alice steps up to the plate. 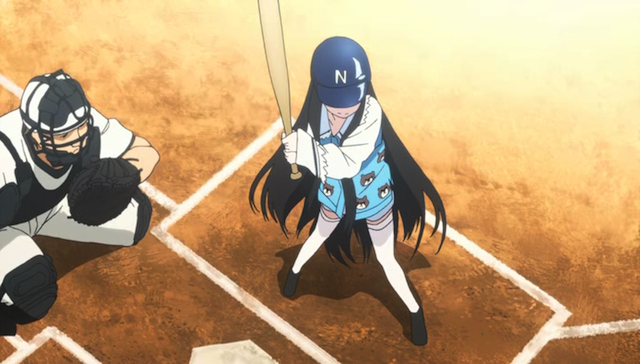 I have a low tolerance for filler episodes, so a one-off like episode 9, in which the cast of Kamisama no Memo-chou (God’s Notebook) gets together to play baseball against some yakuza isn’t high on my list of favorite shows I’ve seen this week. As with the earlier filler episode, the whole thing was rather implausible. The second best thing that can be said about it is that it is over in one episode. The best thing that can be said, is that it was a very roundabout way of returning to the matter of Ayaka’s missing brother. Ayaka’s brother was mentioned missing from the very first episode. Ever since then I have been expecting this to become a plot point. Finally this episode ends with Ayaka being told her brother is nearby. This is quite good news, because I thought Ayaka was one of the most interesting characters in episode 1, and after that she has shrunk into the background. This sudden appearance, and the hints dropped right from the beginning make me think we are finally getting an Ayaka-focussed arc, and it will be the final arc of the show! It seems, like Nemo-san, the producers were holding back their strongest pitch for last. Yes, I’m hopeful that the final arc will be a good one. This may not be my favorite series, but I have seen much worse. Kind of weird how Nemo, who’s barely played a role in this series, got himself an episode solely devoted to him and his past. Considering how more important side characters haven’t gotten such attention, it’s kind of weird to see this filler episode. It does seem to be leading in an interesting direction though, with Ayaka’s past previously hinted at back when she first met Narumi. In hindsight, I guess that was foreshadowing. I’m sure this is leading to a big Ayaka arc, but I agree with you that other characters could have ben given more of the spot light. I think it would have been interesting to learn more about Major; the guy seems interesting, but we don’t know what makes him the person he is.